I am astonished, Father, that you show such respect to a man who denies the Holocaust and whose views are too much even for the SSPX. Dear Father. 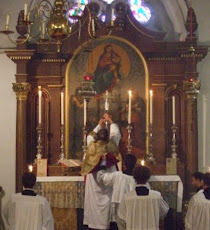 It has been over thirty years since the FSSP came into existence and they are still without a Bishop. Were the FSSP clerics to hold their breath until they do get a Bishop, they would appear to be members of The Blue Man Group rather than fully faithful priests in complete communion with their local Bishops and Pope. The hermeneutics of Revolution has no patience with those whom it considers enemies of the revolution and so the last thing the revolution will do is to let priests attached and devoted to Tradition have their own Bishop - not even ONE. Would the Church in China be in a similar position to the SSPX now that the Vatican has sided with the Communists: should it choose underground bishops, loyal to the faith rather than the Communist party,independent of the Vatican? "Above all, it needs to be very sure that it does not lose its potential ability, in a possible situation of great necessity, to consecrate more bishops sine Mandato Apostolic." This silliness is what got the SSPX and the rest of the Church into such a mess to begin with. I find it faithless. Giving oneself Palpatine-esque "emergency powers" in such a way undreamed of in the history of canon law so that one may *personally* deal with a crisis of apocalyptic proportions...just no. God will provide. This is typically how He works anyways, what with David and Goliath, the Israelites conquering the Promised Land, etc etc. For all his merits, Lefebvre did the cause of Tradition grave harm with his episcopal consecrations. Because of them, those who remained loyal to Rome and Tradition found themselves having to fight on two fronts--against the modernists and now against those abusing tradition to justify schismatic acts. The SSPX has in turn splintered, with the SSPV, the SSPX Resistance with Williamson, and so forth. As for the FSSP, have you considered that their *lack* of a bishop could be a plus, instead of a minus? It allows them to ingratiate themselves more naturally into dioceses, furthering the "mutual enrichment" this blog is named for. Bishops don't exist for their own sake. The FSSP hasn't needed them--and if they have been chafing under diocesan bishops, it certainly has not made them less fruitful. I have no beef with the SSPX and I pray that reach an agreement so that they can be canonically regular again, but even suggesting that the consecrations--and their justifications--are acceptable is too much. Actually, we could use a bishop in Broadstairs, or else in Ramsgate, or Faversham, or somewhere in east Kent. Southwark is the other side of the universe. "This silliness" is what St Athanasius did. In fact he was even "sillier", intruding his bishops consecrated sine mandato apostolico into already occupied sees. It cannot have been, on the one hand, lawful for the saint to have done this, but on the other, unlawful for Archbishop Lefebvre to have done much less. Not really, Tony V. They're quite close by car or fast train these days. Do you suggest, on the other hand, that assistant bishops should be physically distributed about the diocese, in the Anglican manner (e.g. Bishop Trev in Dover)? I fear you might regret what you wished for. Dear junhugie. Your point is understandable but ABS lives in the Diocese of Palm Beach County Florida where it is an open secret that the Ordinary, Bishop Barbarito, does not want to let the FFSP have an apostolic Mission Chapel/Church here because they might be too hard to control. As to your SSPX reference, before he did what he did, both the then Pope and The PCILT (Pontifical Commission for the Interpretation of Liturgical Texts) told the beleagured, well-intentioned Mons. Lefebvre, that a state of emergency is an objective reality, not a subjective one, and that because we had a Pope who could approve Bishops etc, he had no real or legitimate emergency he could appeal to justify what he, very sadly and tragically, did. As to The SSPX becoming the SSPV, one waits for the arrival of SSP2.5. "As to The SSPX becoming the SSPV, one waits for the arrival of SSP2.5." Surely that would be SSP\ ? The courageous Marcel Lefebvre singlehandedly saved the Catholic priesthood and immemorial Mass. And it is both scandalous and a sign of the lethal legal positivism that Herr von Bandenburg rightly mentions above that even in a blog of reasonable, intelligent Catholics the necessary actions of episcopal consecrations by a man whose life was entirely devoted to serving the Church should still be maligned. I guess these ultra-legalistic commentators would rather be totally at the mercy of Francis and his thugs than have canonically irregular bishops whose very "irregularity" was made necessary by the enemies of the Faith that now occupy the highest positions of ecclesial power. The myopia and ingratitude are of monstrous proportions indeed. The idea that there was no objective state of emergency in 1988 is laughable.